Glaucoma is a condition that is a result of increased pressure within the eye. Inside each eye, between the lens and the cornea, a clear, thick watery substance called aqueous humor is produced by the cells of the eye. The function of this watery substance is to nourish the eye tissues and to keep the eye's ball-shape. Normal pressure in the eye is maintained if aqueous humor production and fluid drainage through tiny ports, called "drainage angles", is well balanced. In glaucoma, the drainage and production of aqueous humor is out of sync. In most cases, the drainage angles become clogged but the eye keeps producing fluid, increasing the pressure in the eye. The result? The eye stretches and becomes bigger. Even short-term rises in this eye pressure can lead to irreversible damage if not detected and treated in a timely manner. Glaucoma, if untreated, will lead to blindness. In serious cases in which the eye pressure is extremely elevated, complete blindness can occur in 24 hours! In milder cases in which the pressure is mild, blindness can still occur slowly in weeks or months. Glaucoma may be primary (inherited) or secondary. Primary glaucoma refers to the condition that occurs as a result of genetics. It occurs in quite a few breeds. In particular, Labrador Retrievers, Basset Hounds, American Cocker Spaniels, Beagles, and Shar Peis have a higher incidence of dog glaucoma due to improper development of the drainage angles. Primary glaucoma causes an elevation of pressure within the eye because of abnormal drainage of fluid through the iridocorneal angle. When the angle at which the iris and cornea join is wide, the glaucoma is described as open angle. If the base of the iris is pushed forward, the glaucoma is described as narrow angle. As well, many of the terrier breeds are predisposed to lens luxation. 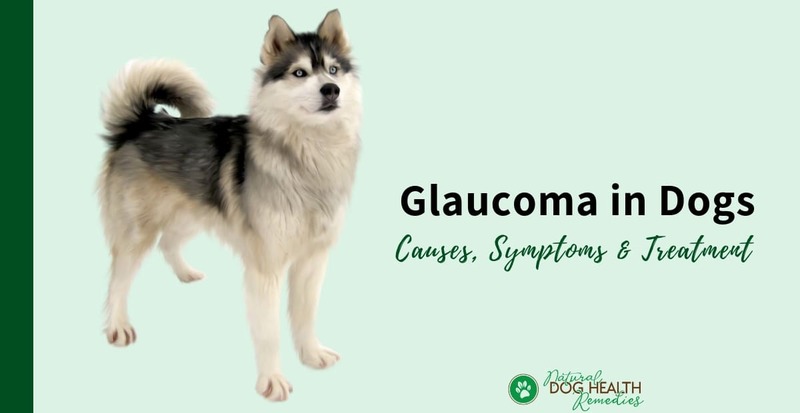 These breeds are also prone to glaucoma because lens luxation can lead to glaucoma. Secondary glaucoma refers to the condition that is secondary to other eye diseases such as inflammation within the eye, displacement of the lens due to trauma, advanced cataracts, or eye injuries such as a penetrating wound to the eye. In addition, allergies and an overactive immune system are also believed to contribute to glaucoma in dogs. Glaucoma is a serious condition that needs immediate veterinary attention. Any delay in treatment may cause serious damage to the eye, resulting in blindness. In fact, permanent blindness can occur within several hours if the pressure is very high and the condition is developing rapidly. The early signs are listed as follows. 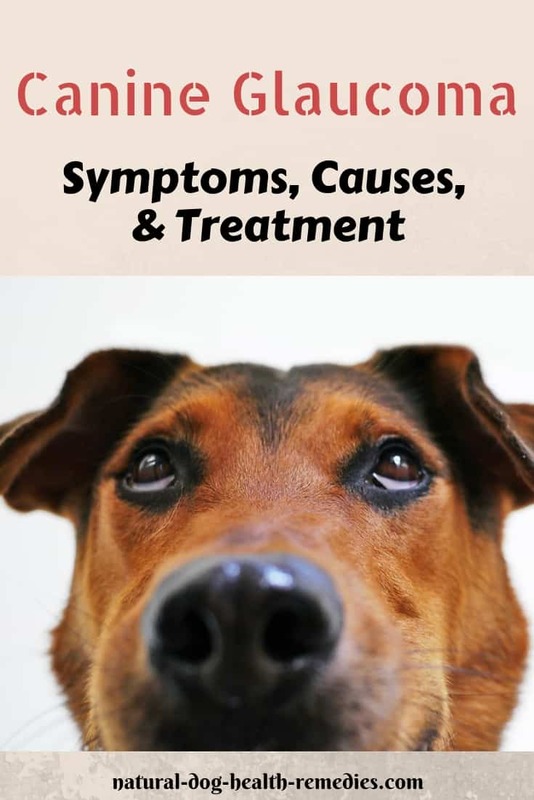 Even if your dog shows just one or two of these signs, consult a veterinarian immediately. Don't delay! Because of the pressure in the eye, it causes a lot of pain in the form of a constant headache or migraine. We can assume that the pain is more severe in dogs than in humans because the eye pressure in dogs can get much higher. As a result, a dog with glaucoma is usually lethargic, unwilling to move or play. He may also have a poor appetite and may show behavioral change - a normally calm and gentle dog may become irritable and grouchy. Click here to see how glaucoma in dogs looks like. Diagnosis of dog glaucoma is to measure the exact pressure within the eye using an instrument called a "tonometer" which is placed directly on the surface of the cornea. If the pressure reading is elevated, then the vet will give the dog immediate treatment to prevent lasting damage to the eye. Conventional treatment involves the use of antiglaucoma drugs that help reduce the inner eye pressure, and then stabilizing this pressure to prevent future increases. Other drugs will also be given to decrease the production of aqueous humor and increase the size of the drainage angles. In addition, anti-inflammatory drugs will be prescribed for topical use in order to clear up any inflammation that might be aggravating the glaucoma. However, the drugs do not seem to work as well as they do in people. In addition to giving emergency treatment to a dog with glaucoma, it is also important to determine the root cause of the eye problem, i.e. whether it is a case of primary glaucoma or secondary to some underlying causes. Your best bet is to see a veterinary ophthalmologist for his expertise in eye problems and his specialized tools and equipment for finding out the root cause. If the glaucoma is secondary to an underlying cause, that root cause has to be treated. Long-term control of primary glaucoma is achieved through surgery (removing the eye) or cryotherapy (freezing). In cryotherapy, a special needle is inserted into the eye, freezing and thus destroying the cells within the eye responsible for the production of aqueous humor. First of all, it is important to remember that herbs and other remedies CANNOT treat glaucoma. However, use of some herbs can at least reduce the inner eye pressure, thus bringing some relief of pain and discomfort to the poor animal. Bilberry: Bilberry (such as Integrative Therapeutics Bilberry Extract) is effective in reducing inner eye pressure. It also contains nutrients that nourish the eyes. Ginkgo: Ginkgo works on blood vessels and promotes blood circulation. It can be used in conjunction with bilberry for dogs with glaucoma. Since degenerative changes in the eyes can increase the risk of your dog developing glaucoma, the best way to minimize the risk of glaucoma is to use supplements to slow down such changes. For example, use antioxidants to minimize cell damage by free radicals inside the eyes. Some effective antioxidants include vitamins C and E, as well as beta-carotene. It has also been found that putting pressure on your dog's neck can increase the risk of glaucoma. Therefore, use a harness instead of a tight collar to reduce any unncessary pressure on your dog's neck, especially if your dog is one of those breeds prone to primary glaucoma.